Penguins are birds that travel best by swimming, as neither male nor female penguins are able to fly. There are 17 species of penguins, according to eoearth.org. They vary in size, depending on species, the emperor penguin being the largest. Most of the physical characteristics of penguins vary based on species as opposed to gender. Male and female penguins do not differ much when it comes to appearance. It may not be possible to tell the two apart without any indications from their behavior. A penguin’s appearance acts as camouflage. Their coloring and feathers make them harder to see by both predators and prey when they are swimming. The way penguins court can vary among species, but there are similarities despite the difference in breeding seasons and habitats of the various species. Male penguins are typically the ones that establish the nest. They do this before they search for a mate. It is the female, not the male, that chooses who they mate with each season. Penguins breed in large colonies. Most penguins are monogamous. 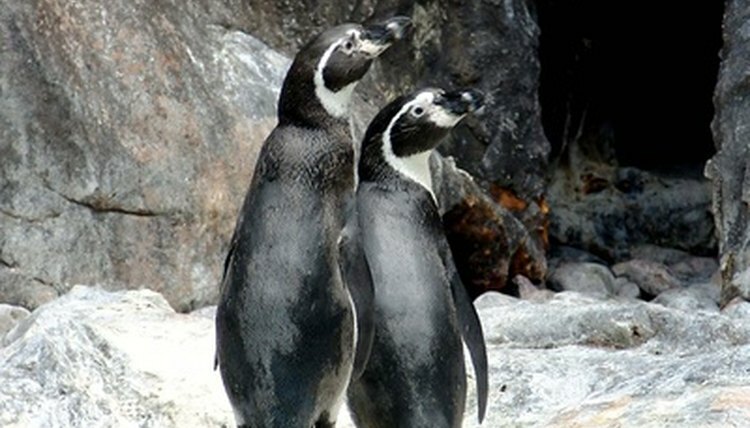 Female penguins that are not monogamous can have up to three partners, while males may have up to two. The breeding season for penguins depends on the species, as does the number of eggs the female lays. The breeding season for a king penguin can last 16 months. Females lay two eggs, although this can vary depending on species. Once the female lays her eggs, both the male and female penguins take turns incubating it, the male going first. The second egg usually gets preferential treatment and is often the only one that hatches. Sixty-two percent of the time female penguins choose to return to the mate they paired up with during the previous breeding season, according to seaworld.org. If a female chooses a different partner, it is often because her previous mate did not return for the mating season. It may also be because the male did not return to the breeding site at the same time, or he found a new mate.